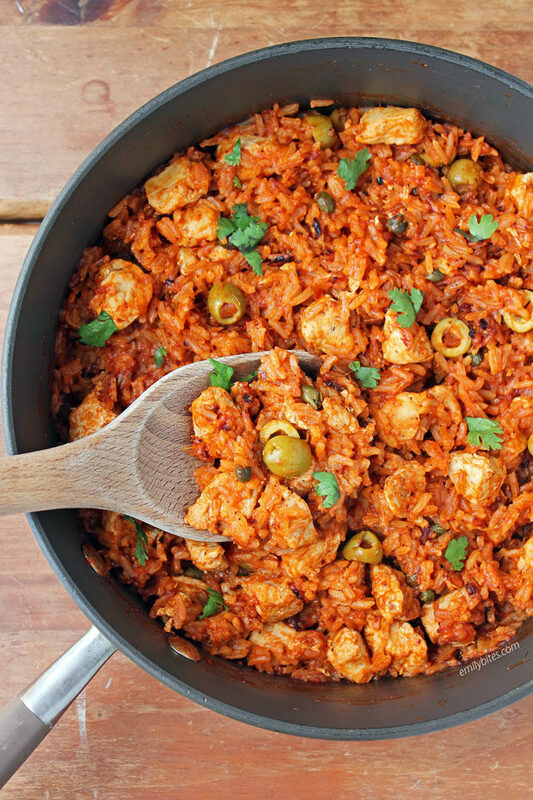 This One-Pot Spanish Chicken and Rice Skillet is full of flavor and perfect for an easy weeknight meal. I love recipes that only use one pan! The olives, paprika and lemon give this dish tons of flavor and a serving is hearty and satisfying for just 400 calories or 6 SmartPoints on Weight Watchers Freestyle. My husband loves rice, so I’m always looking for new and different ways to serve it. I found the original recipe for this dish on Ahead of Thyme and made a few tweaks and it was a big hit. Plus, it comes together really quickly and once you set it to simmer you have time to clean up after yourself, set the table, make a side salad and pour yourself a drink! 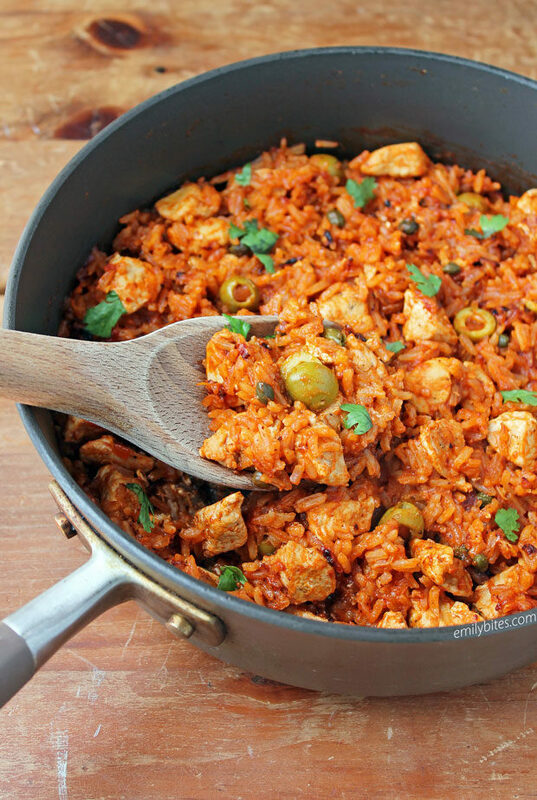 Looking for more lightened up one-pot meals like this Spanish Chicken and Rice Skillet? Check out my Chicken Pot Pasta, Turkey Sloppy Joe Pasta, Beef Enchilada Pasta Skillet, White Chicken Chili, Mexican Chicken Cauliflower Rice Skillet, Thai Turkey with Carrot Noodles, Lemon Chicken Orzo with Tomatoes and Asparagus, Rustic Sausage and Potato Skillet, Beefy American Goulash, Beef Stroganoff, One Pot Cincinnati Chili Spaghetti Bake, Pumpkin Alfredo Tortellini Skillet, Cheesy Chicken Veggie Pasta Skillet, The Best Turkey Chili, Sausage Tortellini Skillet and more in the One-Pot Meal section of my recipe index! Place the oil in a large saute pan or walled skillet and bring over medium heat. Add the chicken and sprinkle with the salt and pepper. Stir to coat the chicken and cook, stirring occasionally, for about 5 minutes. Add the onion and garlic, stir, and cook for another 2-4 minutes until the chicken pieces are cooked and the onion is softened a bit. Add the rice and stir together. Cook for another 1-2 minutes and then stir in the paprika until everything is well combined. Add the broth and tomato sauce and stir together. Bring the mixture to a boil and then reduce the heat to low and cover the pan. Simmer for 20-25 minutes until the rice is cooked (mine was done at 20 minutes, but I think my burners run slightly hot – you may want to check at 20 and stir it around to see if you need more time). Add the lemon zest (you can add some juice to taste as well if you love lemon), olives and cilantro and stir together. I’m not an olive fan… I wonder if it would lose too much flavor if I omitted them? I made it without olives and loved it. I used capers because I like them. We added some hot sauce to make it spicier. This looks amazing, Emily! Can’t wait to try! Thanks for all you do, especially now that you’re a busy mommy! I’ve been missing my mom’s go-to chicken & rice dish from my childhood. THIS will bring back the memories. Easy, tasty, and you even found a minute for me to pour a drink! Thanks for another great recipe. Follow-up: I’ve made this twice now, and it’s wonderful! This is very close to my arroz con pollo recipe. But I use chicken thighs and Goya sofrito and Sazon and add a can of gandules (pigeon peas). Family favorite. Any idea how long you would set the timer for if you did this in an Instant Pot? This looks great. Going to try it this weekend. Made this recipe last night. Very easy and delicious! Added a half cup of green peas the last 5 minuets ! I guess I could look myself but has anyone tried ground turkey breast as this is a zero point food and how many less points would it be? what size can of tomato sauce? Thank you. Could lime zest replace the lemon? Making this right now! Looking forward to trying it. This is so tasty and easy! We add more olives because they’re so tasty! Thanks for the great recipes, this and your buffalo chicken casserole are two of our favorite recipes to make! I made this last night and just had leftovers for lunch. Another A+++++ for Emily!!! For people that enjoy a slight citrus zing with salty bits, this is for you! Very easy to make, and ridiculously low in points. I actually used extra light olive oil and mine came out to be 5 points.